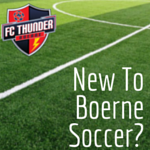 Come join FC Thunder as Champion High School Chargers take on Alamo Heights! Varsity kickoff at 7:00pm. Come early for a giveaway and JV game (kickoff at 5:00 pm). There will also be an opportunity for FC Thunder players to play a youth game on the field during halftime of the Varsity game! Come join FC Thunder as Champion High School Chargers take on Harlandale! Varsity kickoff at 7:00pm. Come early for a giveaway and JV game (kickoff at 5:00 pm). There will also be a chance for your player to participate in a shootout during half-time of Varsity game!